Visit www.fastvideoindexer.com/download.htm and click the download link. Fast video indexer supports almost all video formats, if it can be played in windows media player it can probably be captured. Mpeg-2 and VOB files are supported from version 1.04, note that you still need an mpeg2 codec installed on your computer. To be able to capture screenshots from a video you need to have the correct direct show video codecs installed on your computer. Try playing the movie using Microsoft media player, if it can not be played back there the program should direct you to the correct codec. If you have Windows 7 the movie may play in windows media player even if you don't have codecs installted. Fourcc.org lists codecs required for different fourcc codes (format codes). The GSpot program will help you determine the codec you need to play avi files and the codecs you have installed, if you have an internet connection Fast video indexer will also try to detect a suitable codec to install. Othervise try visiting www.free-codecs.com for programs to identify the codec you are missing and to download the missing codec or one of the many codec packs. Microsoft has a very good page on supported codecs in a knowledge base article Windows Media Player multimedia file formats. If you know the name of the codec you are missing try searching on google. You need to download a DirectShow codec for QuickTime. Try downloading the QT Lite codec. Read more about QT Lite at wikipedia. Even if you have QuickTime installed you might not have a Direct Show codec (filter) installed. A Direct Show codec is required to play the video in Windows Media player and in Fast Video Indexer. You need to download a DirectShow codec for Real Media. Try downloading the Real alternative. Even if you have Real Player or RealOne installed you might not have a Direct Show codec (filter) installed. A Direct Show codec is required to play the video in Windows Media player and in Fast Video Indexer. First of all mp4 (mpeg-4) is a container format so the data can be compressed in a number of different ways inside your mp4 file, just as with avi files. Try to play the movie in windows media player. If it crashes in media player the problem is the codec used to play the movie. Try downloading a new/different codec for the movie format. If the problem is only with Fast video indexer feel free to contact our support and do send the crash log. Your system is missing a system component. Fast video indexer will attempt to fix this but the program will need to be restarted for the change to take affect. If the problem persist you are missing the file msxml4.dll, this can be reinstalled by downloading MSXML 4.0 from Microsoft. There is a simple trick to capture every frame of a video. On the options screen set the "start after" value to 0 and the "save every" time to 0. You can also set the time between sample to a fraction value but since the time is entered in seconds you then need to know the number of frames the video is recorded in. Setting this value to 0 will adjust the time to the required time step and it will work for several videos recorded with different framerate. If you use Fast video indexer 1.15 or earlier you need to go to the advanced settings and set the "name by frames" to 1 instead of 0. Fast video indexer will by default name captured video frames with the hour/minute/second of the video frame. If you want to capture all frames of a video several frames will be taken each second and will lead to the same filename. This has been fixed in version 1.16 and the name now includes ms. There is a known issue with some special non english characters if they are used in path names. You can solve this in two ways. Either make sure you video frame folder and the index folder paths dont contain non english character. The other way is to turn off capturing of images and only generate an index picture, then the program will handle the paths correctly. How can i capture exactly x thumbnails from every video in a list? On the options screen set the "start after" value to a large time, longer than any of the videos and do the same for "save every". Then set "capture least nof frames" to the number of video thumbnails you want from each file. I get "Error capturing from ... - Failed creating DirectShow filter FVISampleGrabber!" FVISampleGrabber is a component that is installed with Fast video indexer but for some reason it can not be found on your system. Try reinstalling the software. If Fast Video Indexer freezes in the middle of a capture, first check if there is a printed message in the status field at the bottom of the program window. If Fast video indexer encounters an error in the video stream it will use serveral teqniques to trying to recover from the error, this can take time up to several minutes. There is NO limit in the program on the number of video files you can have in your list. But, if you have a large video list using different codecs there is a bigger risk that one of the codecs used by one of the videos will cause a problem, and it may not not be in the video where it freezes. If the program freezes on the same video, its most likely a codec issue. Read my article about how to resolve it here. If the program freezes at a random video in a list first try to restart your computer then see if the video type it freezes on is always the same type, for example a .rm file. Then try to see if you can change that codec. 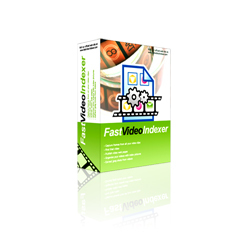 I have purchased Fast video indexer, can I use it on my laptop as well? Feel free to install your copy on all your own computers. Does Fast Video Indexer work on windows 7?